Thank you for supplying us with cards in Ubaydi, Iraq. The Halloween cards are beautiful. I was going to write home on some medical pads before I found your box of free cards in the recreation area. It is wonderful to see an organization that is so thoughtful and “crafty.” Thank you again for the mini works of art. On or about the 21 of September, I rec’d a box of greeting cards from Operation Write Home. Thank you so much for sending them to me. I must say, I have the BEST wife in the world. I would have never thought to find an organization like yours on my own. Truly she is an amazing woman. Perhaps that is why God blessed me with her. God knows I need the help and support that she has been to me. I’m so happy she contacted your organization. Again, thank you so much as you’re going to make many of our soldiers smile. Our card selection in the post exchange isn’t very good. We only have 4 sections to choose cards from and the good ones get taken right away. You and your supporters are awesome and what a blessing you’ve become in making a difference to a soldiers life. Now I can send my wife a real Anniversary card and a real Birthday Card to my 2yr old son. Thank you so much for the cards. You responded so quick it was absolutely amazing. I believe the box was here about a week after I sent you the email. And you very much for the personal card and the inspiring words. It is amazing to me how many cards you send in one box and support so many units. You must have a whole lot of people making cards to produce all the cards you all send out in a month. The folks here love them. They are indeed absolutely gorgeous cards. I am very impressed and amazed. Again, thank you so much. I pray God’s continued blessing upon you. I thought you would like to see a couple of pictures of service members selecting your wonderful cards – they really are a HUGE hit here! We can’t wait for the next shipment to arrive! 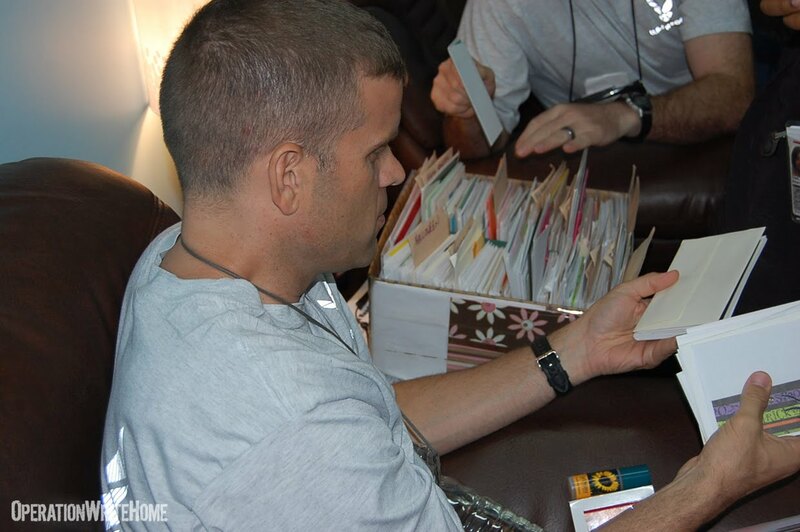 Thank you so much for the cards…I just arrived here and have seen the impact the cards have on our troops. What a blessing! 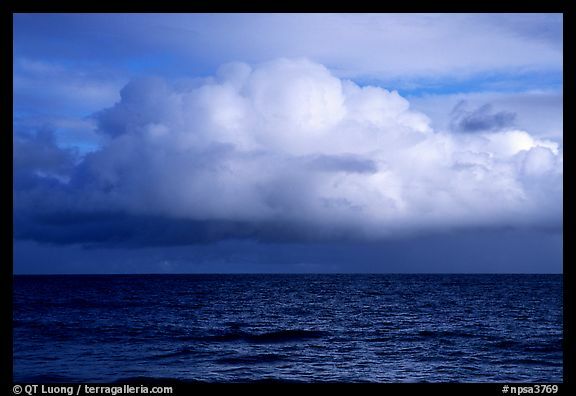 May God continue to watch over and bless your outreach…OBTY, plz keep them coming. Many thanks to allllll of you who have made cards, donated funds, and helped get the word out about this project. Just think…those 200,000 cards have touched not only 200,000 heroes — but 200,000 family members and friends at home, and likely more than that. You have blessed probably half a million people with the cards you have made! KUDOS! Sandy: Love and miss you cards are the ones I could use the most…make them in fall and wintery colors/themes and they’ll fit my boxes perfectly!Thanks! Fabre: Love You, Miss You, cards for children. Also a reminder, I can still use cards to fit the A9 and A7 envelopes – email me if you need the sizes! Kris: I don’t really have any “needs” as I have gotten so many cards lately but I guess my biggest lack would be Anniversary and thank you cards. You have the right to purchase a certain cardmaking item for no other reason than because a) you like it; b) you think it’s cute; c) you’ll never find it again, or; d) you know you’ll use it someday. You have the right to a workspace of your own. This may be the basement, your college student’s old bedroom or the kitchen table. You have the right to request peaceful, kid-free, stress-less cardmaking time – guilt-free. You are creating a treasure – and part of that treasure is you. (And you wonder why your shippers aren’t on Facebook much lately?? They’re madly stamping, sorting, and packing!) THANK YOU everyone, wow! And a huge thanks to our shippers who put in so many tireless hours each day getting these boxes together! Shirley V, Rochester MN….thank you for the Any Hero letter and the cute Halloween cards! Beverly T, San Francisco CA – your cards are absolutely adorable, our heroes will love them! And they’re my first with OWH on the back – hooray!!! Nicole S, Martinez, CA – oh my, all the LOVE cards! I needed these for my boxes so much, our heroes keep asking for more love cards. Thank you!! Your financial donation and extra envelopes are much appreciated too! Robin S., Parma, OH – Thank you so much for the wonderful batch of Christmas and holiday cards – Tis the Season! Ann R., Palmyra, NJ – Awesome seasonal cards, thank you for sharing them with OWH and our military! Carol O, Kerry G, and Jen W, Simi Valley CA – whoa, what beautiful cards you made, THANK you! Carmen O., Toledo, OH – Beautiful cards, thank you so much – they will be snapped up by our heroes! Shirley M, Ruidoso NM, thank you soooo much – your wonderful cards, AnyHero letters, and financial help are a huge blessing! Cheryl L. and the Manhattan Scrapbookers, New York, NY – What a fun, diverse collection of cards! We especially loved the witches boot for Halloween! Great job! Marcy K., Canton, OH – Thanks so much for sending your FIRST shipment – perfectly done – dark cards lined, and OWH label on back – awesome job! Welcome and Thanks! Rita J, Rudolph WI…….thanks for the great box of cards. Sure was heavy. Kathryn H, San Jose CA – thanks for the pretty cards and the great AnyHero letters! Barbara H., Nashville, TN – Thank you for the shipping donation at the Creating Keepsakes convention in Nashville – it was very generous of you to help! Carolyn F., Liberty MO…thanks for the pretty cards!! Cynthia B, Dearborn Heights…..what stunning cards! Thank you so much! 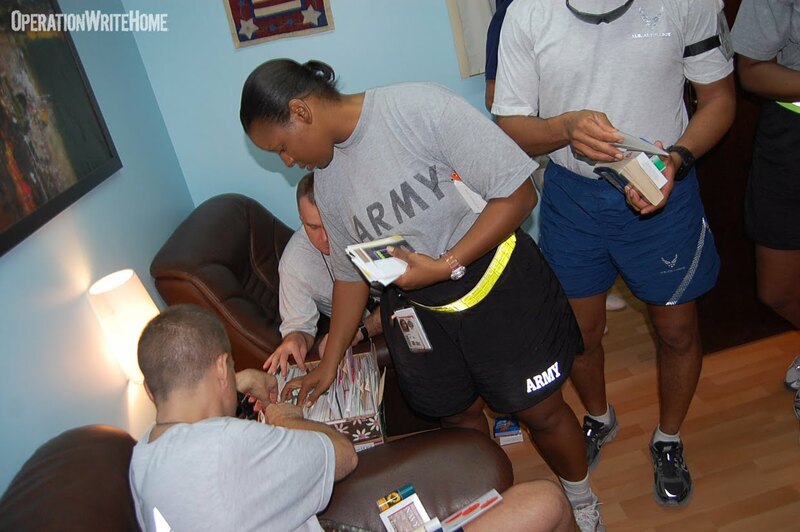 Donna B., Jacksonville, FL – Thank you for thinking of our military personnel and sending cards! Darlene A., Palm Bay, FL – Your cards put us in the holiday spirit! Thank you so much! Mara A. and Judi W., Westminster, MD – Your cards are amazingly beautiful – thank you so much! To the Cardmakers at the Creating Keepsakes Convention, Nashville, TN – Thank you so much for donating cards and thinking of our service men and women! Unknown Cardmaker, Louisville, KY – Thank you for the wonderful any hero letters, and greeting cards! We don’t have your name but please know we appreciate you! Susan W., Rutland, VT – Just a wonderful assortment of general cards – they could not have come at a better time – thank you! Tammy T., Charleston, WV – Great any hero letters, and wonderful cards too! Thank you so much! Deloris T., West Salem, OH – Great cards, as always! Your support of Operation Write Home is greatly appreciated! Cecilia S., Raleigh, NC – Fantastic box of Halloween cards – loved the colors! Jeanne S., Hebron IN…..thank you for the great cards!! Beautiful!! Sue S, Hendersonville TN…..thank you for your first box of cards. They are beautiful!! Carole Ann S, The Woodlands TX……Thank you so much for all the Any Hero letters. Also for the beautiful cards! Judy R, Minneapolis MN…..thank you for the cute Halloween cards! Pamela R., Milford, CT – Your cards were wonderful, especially the ones for kids which are always extra special! Thank you! Tracey P., Johnstown, PA – Awesome elegant and yet spooky Halloween cards – great work! Thank you! Janet P and Diane L, Lawrence KS……thank you ladies for the wonderful cards. Shelly P., Royal Oak, MI – Awesome job with another great box of cards! Thank you so much for your support! Karen P and Kayla Jo B, Chicago IL…..thank you for sharing our cause with others in your area. These cards are wonderful!! Kathy P. and all the cardmakers at Scrapbook Island – thank you so much for an amazing array of cards! Fantastic job! Dawn L., Racine WI….Thank you for the package of beautfiul cards!! Pamela L., Mineral Bluff, GA – Thanks for the great spooky and fun cards – perfect for our fall boxes! Linda K, Grant MI…..beautiful cards as always! Thank you! Gai J, Dallas TX…..another package of beautiufl cards!! Thank you so much! Linda D, Hutchison MN…..this box is full of BEAUTIFUL cards! Thank you. Sheryl D, The Woodlands TX…….WOW! Didn’t think I was ever going to make it to the bottom of your box. These are awesome! Marianne C, Naches WA – thank you so much, what pretty cards! And thanks for the shipping donation!! Andrea C. and Friends, Boca Raton, FL – Great box of cards, and special thanks for making A9 cards for our LARGE envelopes – you did a great job with those! Thank you! Carrie C., Harclock, NC – Thank you for the cute and funny cards! Jason B, Keller TX……These are WONDERFUL Any Hero notes from the children. THANK YOU! Karen B, Fort Worth TX……thank you for the package of gorgeous cards! Barbara B, Lakewood CO….love the Halloween cards! Ruthann A, Blairsville GA……wonderful Christmas cards! Love them. Thank you. Sandy A, Elizabethtown KY…..What spooky Halloween cards!!! Thank you for the many Any Hero notes. Char, Rhonda and Linda at Memories from the Heart……thank you so much for the stunning Christmas cards!! Love them. Cardmaker Wallace, Melbourne, FL – Thank you for the great assortment of Halloween and general cards! Donna R., Worcester, MA – Thanks to you and your Thursday scrapping friends for the wonderful cards – perfect for the upcoming season! Robbie R., Hollywood, MD – Beautiful cards – great job! Thanks for sharing them with Operation Write Home and our military! Jamie P., Pittsburgh, PA – Thanks for watching the video and preparing the cards to make the shippers work easy – great job! Joy O, Carmel IN….thank you for the wonderful box of pretty cards!! Denise L., Pismo Beach, CA – Thanks for answering the call to make some of the A9 cards – they were great! Michelle H., Merion Station, PA – Thanks for the lovely cards, and a generous shipping donation too – very appreciated! Pat G., Upton, MA – Thank you so much for bringing your cards to A Time For Memories in North Grafton! Bonnie C., Virginia Beach, VA – Great general themed cards, thank you so much! Jennifer B., Broad Run, VA – Thanks for your first shipment of cards – they are absolutely beautiful! Janine C, El Monte CA, your cards are always so awesome—thank you so much! Denise W, Las Vegas NV – thanks so much for another box of wonderful cards! Janet W and the Womens Relief Society, 10th Ward LDS – wow what a box of cards, thanks!! Maggie W., Upton, MA – Thank you for the beautiful Christmas cards – they are stunning! Lianna V, Huntington Beach, CA – thanks so much for the great spooky and Christmas cards! The donation for shipping ROCKS, bless you, friend! Karen T and Branches Christian Church, Buena Park CA – beauuuuutiful work, thank you so very very much! Patti S, St Louis MO, thanks for all the wonderful Christmas cards – and the extra envelopes are a huge blessing! Patti S. and the Cardmaking Ministry at the United Methodist Church in Chesterland, OH – Thank you for the adorable Halloween cards, our service men and women will love sending them to their families! Kathy S., Sacramento, CA – Thanks for the great Halloween (and other) cards – and welcome to OWH! Holly R, Erie CO…..what a great box of cards!!! Beautiful! Jayne R-E,Fortson GA….WOW! Love these cards…..beautiful!! Lani R., Westampton, NJ – Your amazingly organized box was a big help to us, and wonderful for our heroes – thank you for your donation! Kay P., Fleming Island, FL – We never thought Halloween cards could be so beautiful – thank you so much! Donna M and Arctic Height Elementary – I am blown away by your wonderful cards and letters, wow! Thank you soooo much on behalf of our heroes!! Sandy M., Ona, WV – Great idea on the trifold cards to give our heroes more space to WRITE HOME! Thank you so much! Carol M., Waukesha, WI – Thank you so much for the beautiful cards with touching sentiments – they will be very popular! Mary Alice and Michaella M,Rochester Hills MI….thank you for the scary Halloween cards!!! Dawna L., Bloomington, IN – Welcome to OWH, and thank you so much for sending your first box! Great cards! Lillian L and girls – what a great bunch of halloween cards, and all the way from South Korea! Thank you! Anita K, Sealy TX….thanks for the nice assortment of themes. They are all beautiful. Maz K., Hopewell Junction, NY – Thanks for the great any hero letters and beautiful cards – your donation is appreciated! Judy J and the Red Hat Group, Rose Lip Maidens, and Woodbury School Teachers, Mission Viejo – wow! So many pretty cards, THANK you! Lynne H, Tampa FL….Your cards are beautitul and so appreciated! Karen G and Mainstreet Christian Church, Oakland Park FL – fantastic box of goodies, oh my! Cards, letters, fibers, papers – thanks so much! Nora G, Medford OR – such adorable Thanksgiving cards! And your shipping donation is truly a blessing, thank you! Lynn F., Wilmington, NC – Great assortment of cards, thank you so much for donating them to our heroes! Seongsook D. and friends, Elk Grove, CA – Thank you for a box loaded with wonderful cards – and thanks Seongsook for telling all your crafty friends about OWH! We and the heroes appreciate it! Maria C, Vallejo CA – oh my what beautiful cards! Thank you sooo much for sharing your talents with our heroes!! Eydie & Jessica B., Cherry Hill, NJ – Go mom & daughter – what a great activity to share together, making cards that mean so much to our service men & women! Great job! Lee B, Dalton WI, another box of really cute cards!! Thanks so much…your AnyHero cards and financial help are wonderful as well! Martha B., Santa Rosa, CA – You make the BEST cards for kids – I know they fly out of the boxes when they arrive to our recipients – thank you so much for your continued support of OWH! Maude B and Stamping Divas……great cards!!! Love them all. Unity Church of Peace, St Louis MO……thank you for the spooky box of Halloween cards. Lori N, Jefferson City MO…..thanks for the awesome cards. Love them! Lynne M, Hoquiam WA, thank you for all these amazing cards – each one is just so beautiful! Nancy M, wow! Thank you so much for all the fantastic cards – perfect! Your shipping donation rocks, too, bless you!! Nancy C, Hollister CA, how you ever got that many incredible cards in one box – wow! Thank you sooooo much! Leslie F, Clinton UT, another package of awesome goodness…thank you!!! Help Us Win Money For “Operation Write Home“… We Need Your Vote! Christie Cookie is giving away $25,000 to charities. The charity with the most nominations wins $10,000. It only takes about a minute to vote, so click on the link below and nominate OWH to Win! We’re in the drop-down menu, so scroll down to our name. Only one vote per email – but be sure to tell ALL your friends to vote for us too!